In January 2002 dozens of shackled men were taken to Camp X-Ray - as shown in a notorious photograph. Shortly after dawn on a late-summer day more than a decade later, the sky is streaked with pink. "Welcome to Camp X-Ray," said Sgt Cody Stagner, a military public-affairs official. He was addressing a group of journalists taking a tour of the place. It was a friendly greeting - and jarring, given the history of the camp. More than a decade ago a defence department photograph showed a group of men who had been captured in Afghanistan and taken to the prison. The detainees are wearing goggles covered in black masking tape and surgical masks, and their hands are secured in manacles. In bright sunlight, they are kneeling before Americans. The photograph sparked controversy around the world - and became a symbol of US President George W Bush's "war on terror". Today the camp is enclosed by steel fences, topped with concertina wire, and a sign that says: "Off limits - trespassers will be prosecuted." Sections of the razor-sharp wire are overgrown with vines. A step on a wooden ladder of a guardhouse is missing. The door is chained shut, and bugs swarm around it. Sgt Stagner pointed to a sign that said: "Guard Tower Five". "That's the last remaining marking in the camp," he said. The detainees were confined here from January to April 2002. At that point they were moved to another part of Guantanamo, a facility known as Camp Delta, and were placed in cells that were housed in sturdy buildings. Today there are 164 inmates who are held at various facilities at Guantanamo, and earlier this year more than 100 of them were on a hunger strike. US President Barack Obama is "fully committed" to closing the military prison at Guantanamo, according to a White House spokesperson. Recently Mr Obama has stepped up his efforts. Earlier this month he spoke with two envoys - Cliff Sloan at the state department and Paul Lewis at the defence department - who are heading up the administration's attempt to shut the prison. It was the president's first publicly announced meeting with the envoys. Meanwhile Camp X-Ray looks much as it did when the detainees arrived in 2002. It is protected under a court order - "preserved as evidence for any trial that might come about", said Sgt Stagner as he walked along a worn path. 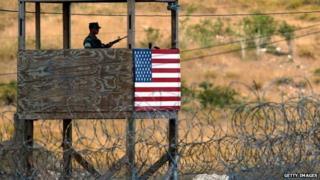 Liz Sevcenko, the director of the Guantanamo Public Memory Project, said: "It's been designated as a crime scene. There's a contest of whether what happened there was criminal or not." The detainees lived in open-air cages that measure 1.8m by 2.4m and are made of corrugated metal roofs and wire mesh. Snakes slithered through the wire mesh - some menacing. At Guantanamo pythons grow to 10ft (3m). For several hours a day the detainees were exposed to direct sunlight - at a time when temperatures were more than 32C (90F). As Sgt Stagner walked past the cages, a banana rat, a rodent that is related to the guinea pig, squeaked. "Has anyone ever escaped from here?" a visitor asked. "Of course - Harold and Kumar," said Sgt Stagner, making a joke about the 2008 movie Harold and Kumar Escape From Guantanamo Bay. "They're the only ones." Sgt Stagner's remark shows how things have changed. Back in 2002 few people were joking around about Camp X-Ray. Near the cages where the detainees lived are five plywood huts that were used for interrogations. Men from the Central Intelligence Agency and the Federal Bureau of Investigation questioned the detainees in these rooms. Detainees wore red fluorescent jump suits. Some believed this meant that "they were condemned men awaiting execution", according to International Committee of the Red Cross (ICRC) representatives. They spoke with the detainees several days after they arrived. Media captionPainter Steve Mumford portrays Guantanamo Bay like you've never seen it before - in watercolour. The findings of the ICRC appear in a US defence department document that was leaked to The Washington Post newspaper. Today the path that leads from the detainees' cages to the interrogation huts is soft and spongy - and littered with bones from a deer. Inside one of the huts a chalk line is marked on a door. The huts evoke images of other places, some of them literary, that have fallen into disarray. "Time stands still yet everything turns to dust," said Miss Havisham in Great Expectations. In the hut a fluorescent light, a long bulb encased in wood, is thick with dust. There is a table and a small window. The walls are made of untreated lumber, and they are spotted and worn. From the window you can see the Cuban hills and lush vegetation. Back then air-conditioning units blocked the view. In other ways, too, the detainees were cut off from the world. They knew almost nothing about their surroundings. "Detainees want to be told where they are," said the ICRC representatives. In 2002 three senior UK judges ruled in the case of Zumrati Juma, whose son was held at Guantanamo, and described the prison as a "legal black hole". At the time journalists were not allowed to visit Camp X-Ray. Today they can see the place. And officials say that it will remain the way it is - until Guantanamo is closed.